Hamanishi Katsunori is considered one of the world’s leading mezzotint artists and is highly admired by the artistic community itself for his meticulous work. In this most demanding of print making methods, Hamanishi-san achieves a sumptuous variety of tones and depth of color, the result of detailed burnishing of the plate and many trial printings. Hamanishi-san’s earlier mezzotints depict shapes—branches, ropes and wooden objects—presented in three-dimensional form on paper. His recent works include rich, saturated color and the addition of gold, silver, or copper leaf. Born in 1949 in Hokkaido, Hamanishi-san graduated from Tokai University in 1973, later studying at the University of Pennsylvania on a grant from the Cultural Affairs Agency from 1987 – 1988. 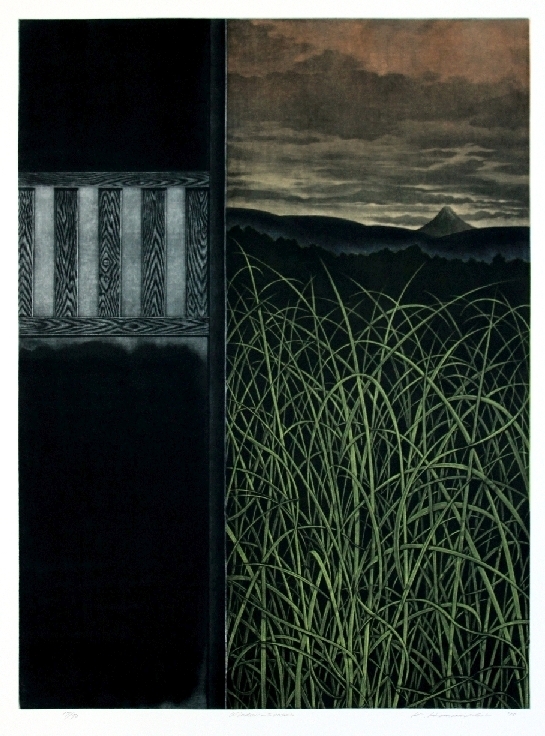 Highly awarded, Hamanishi-san has won prizes at the Ibiza International Print Biennial (1978), the Grenchen International Triennial in Switzerland (1982), the International Mezzotint Competition (US, 1987) and the Valparaiso International Exhibition in Chile (1989) among many other competitions. His work has been exhibited in Paris, London, Brussels, Philadelphia, San Francisco, Seattle, Hong Kong, Tokyo and Kyoto. He has lectured at the British Museum and exhibited frequently internationally.